EDC Training Centre contributes in building professionals’ competencies through providing premium quality training services for EDC, as well as any potential customers, in their efforts towards safe and professional operation. Putting the value of safe operation ahead, we, the Training Centre team utilize the power of knowledge to work on continual development of learning process to achieve the goal of competent operation. We provide training and learning services bundled with world- class products and customer support. 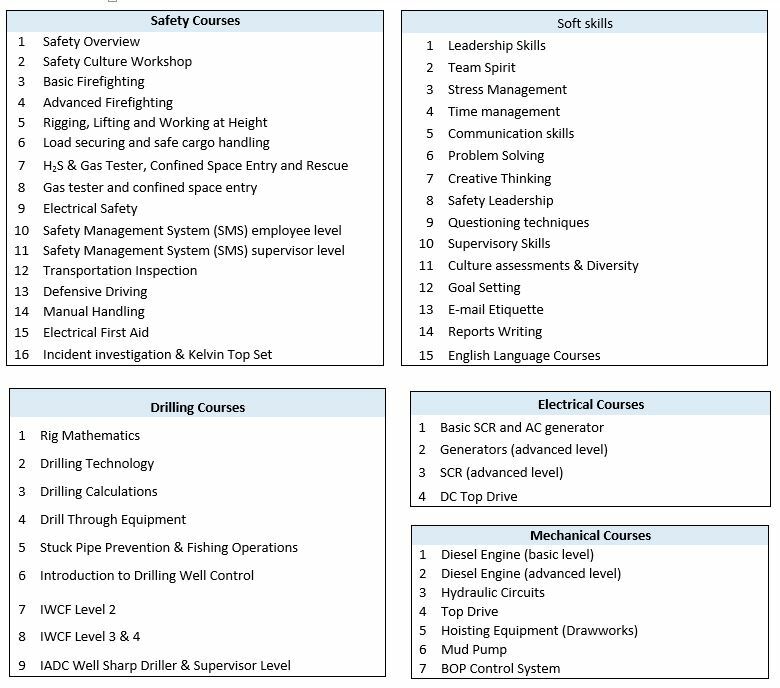 To meet any specific training requirements, we offer both standard and tailor-made courses that focus on how to operate and maintain Drilling Operations in the field. Operations will run more smoothly and economically if equipment operates reliably and is safely, operated by skilled professionals. It is about investing in competence, sharing experiences and preparing for familiar and complex operations, but also to prepare for the unexpected. The Training Center exerts all the effort possible to keep its employees up to date with the market skills and its requirements. The training compliance percentage for EDC employees has reached up to 88% in Q3 2018. • Accredited instructors and programmes tailored for your individual needs. • State-of-the-art simulator DS-5000 to ensure the up-most realism for operational scenarios. For all field positions before promoting to a higher position. Technical Assessment for key positions upon client request. • Simulator Based Training and simulating critical incidents related to the well control on DS-5000 full scale simulator.